Crochet with Me!! Winter 2017 CAL… Week 6! 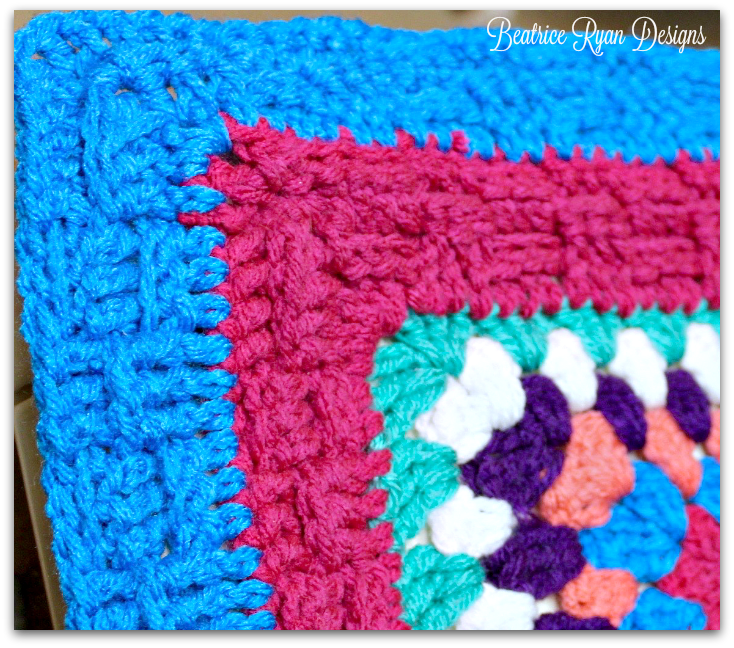 Week 6 of our 2017 Crochet Mystery Afghan has been so fun… Many of you asked about the way the center was… So open and worried that it wouldn’t be good.. I agree… So… Here is the Center Fill in Option… I am leaving mine with the fill in!… I loved the way it turned out with so little effort… The chains and cool way the purple edge really pops!! You can leave yours open if you prefer… It looks great that way.. maybe just not practical…. One of the really cool things that is added this week is a crystal button to the center of the flower… What do you think?? 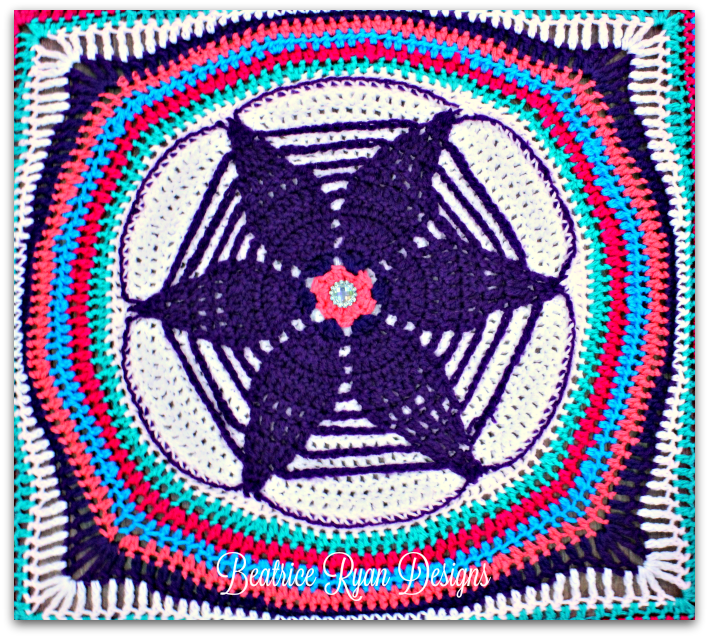 Each year my Mystery CAL Afghan is a surprise to me too… I only design a week ahead of the release… so, it is just as fun for me to see how my designs in my head come out in person… I hope you love it… it is easy to do this section… just take your time. and find a great button!! Here is what the back looks like… There is a slight pinwheel look due to how we increase… and a ridge where I joined using a single crochet method… But, if you like it smooth… you can just sew it into place! Are you ready to get started… And make sure you go all the way to the bottom for information on the Awesome Red Heart Sponsored Giveaway we will have at the end of the project! First, Choose a color that will make your project flower show up well… I picked white… My Pink would have been ok too… But the lightest color really shows off the chain spaces and the flower!! Ch 3, with sl st, join to form ring. Now to crochet (or sew) this section on the afghan! With wrong side of afghan facing, carefully line up the new section with the flower petals so that the 2 sc on the new fill-in piece line up with the slight dip where the tips of the flower petals are in the afghan round 11. Join with a sl st in one of the dc’s in the fill-in piece. Now, going through 1 st of the backing and around the post of a st from round 12, make a sc. repeat this in each st around. 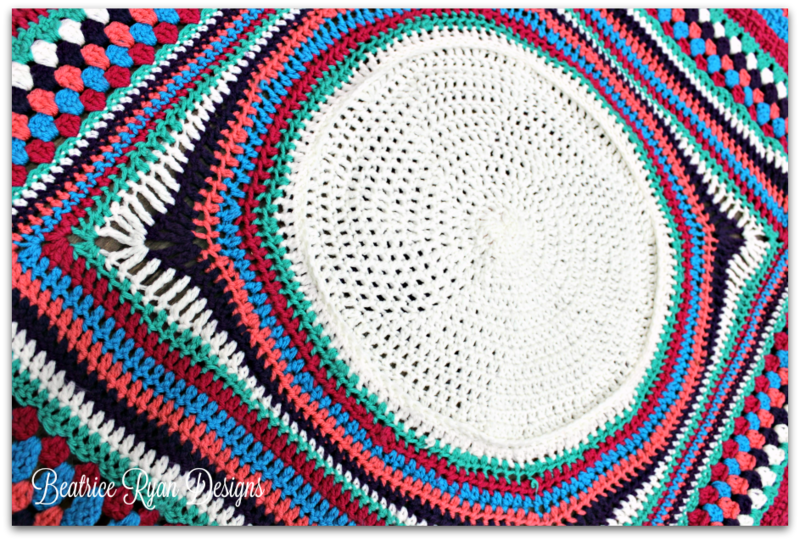 So, basically you will be crocheting one stitch of the backing with a post st of round 12… This causes a small ridge on the front side… Round 12 in my afghan is also white… Because round 11 was in purple… it looks really cool on the front! Last step is to fasten a button from the front of the flower through the back of the fill in piece directly in the center… If you prefer not to use a button…. 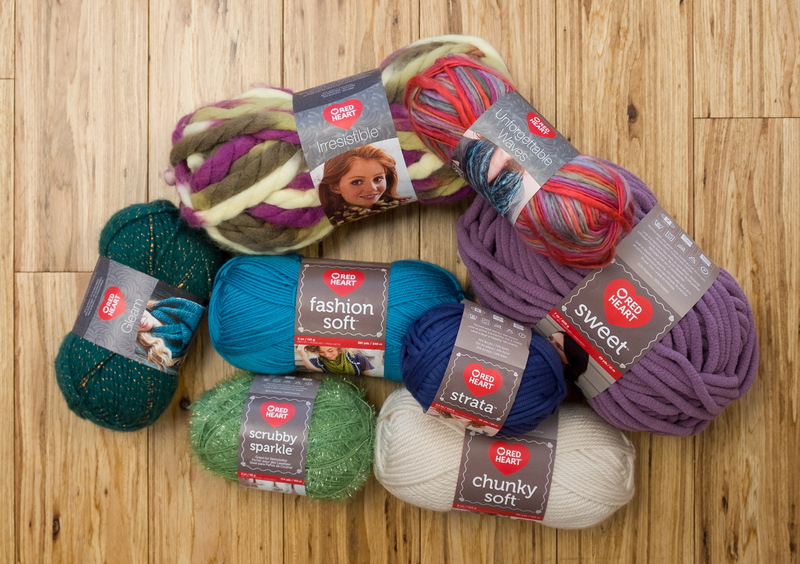 Just secure the centers with yarn. Now for a row on both long sides of the afghan to tie last weeks color and stitching all together! Repeat on the opposite side of the afghan. Congratulations!!! That is all of the crocheting for week 6!! Now.. Here is a little more info on the Red Heart Sponsored Giveaway… Red Heart Yarns is sponsoring a lovely yarn Giveaway worth $50... By participating in the CAL and finishing your afghan in the allotted time… You will be eligible for the giveaway.. So, you may be wondering what the “allotted time” is?? Well, this is a 12 week CAL.. So the last weeks instructions will be posted on April 10th 2017… you will have until April 24th to finish the project in full! If you finish in time, you will email me a clear photo showing the full afghan. Also giving permission to add your photo, first name and last initial to be posted in a grand finale post… On April 29th, I will choose a winner using a number generator. Each photo will get a number and those will be put in for a chance to win!! Good Luck!! Crochet with Me!! Winter 2017 CAL… Week 4!! Crochet with Me!! Winter 2017 Crochet Along… Week 4!! This CAL is flying by… We are 30% done at the end of this week!! Each week hopefully the instructions aren’t to overwhelming… It looks like in our CAL Facebook Group you are all doing an amazing job… I love all the pictures!! 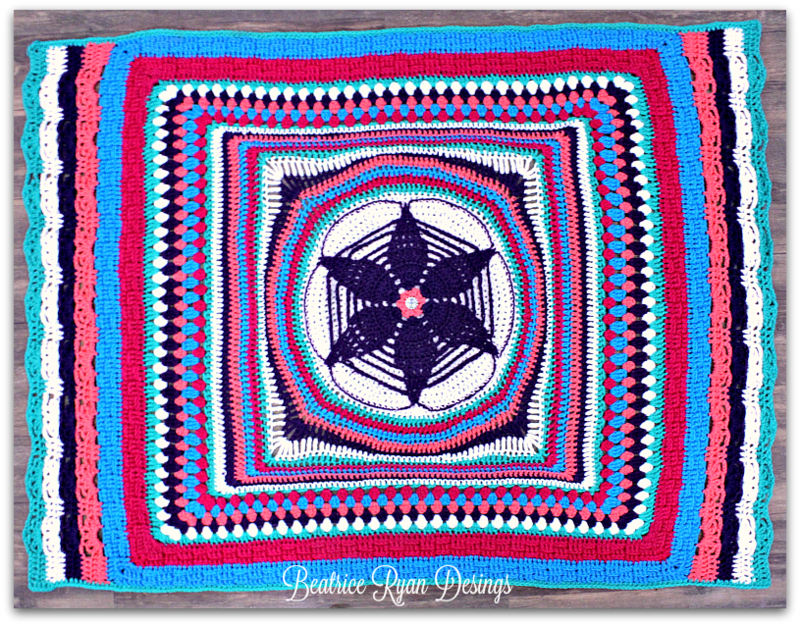 If you haven’t joined yet, just head over to Facebook and ask to join.. Beatrice Ryan Designs 2017 CAL! !We are having so much fun!! It looked like everyone enjoyed last weeks Granny Stripe.. This week is just as simple… A few rows of the same stitching and … Voila… You are done with week 4! I can’t wait to see all of your pictures this week!! *When working this section, make sure to watch your tension… If you crochet tight.. you may want to go up a size hook.. I did just fine with my tension, I just kept checking how it looked at the end of each round.. it will relax so don’t make it to loose either. That’s It.. You did it!!! Congratulations!! 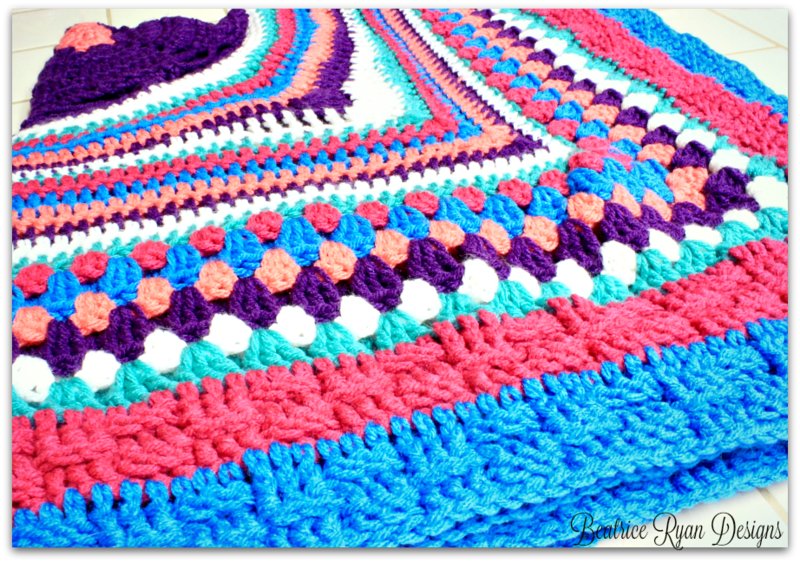 I hope you love your Mystery Crochet Along Afghan so far!! Next week,,, Stay tuned for all the details on our Red Heart Giveaway!!!! 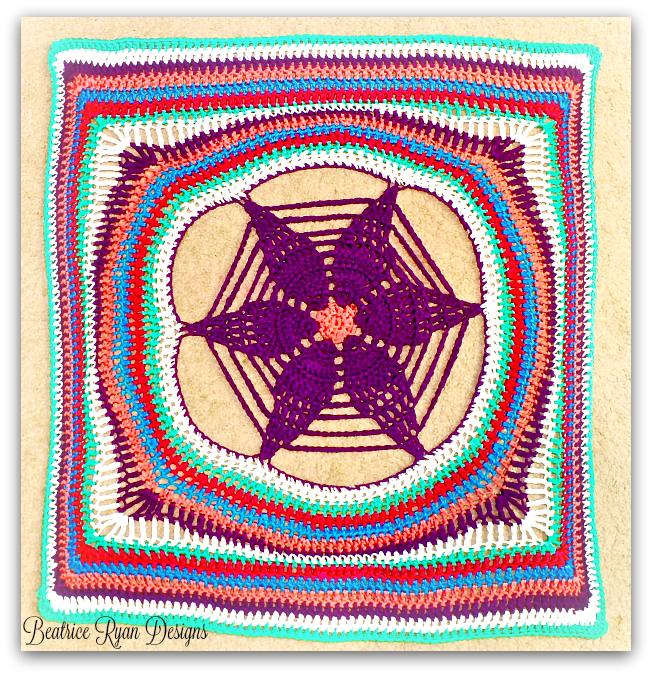 Crochet with Me!! Winter 2017 CAL… Week 2! Week 1 of our Crochet Along had a few small challenges… Trying to work up the project while traveling led to a couple of pattern typo’s… So sorry… Week 1 is all correct now and we are ready for week 2!! This week we will be squaring up ~ then making it into a rectangle… Hmmm that will be interesting right?? Don’t worry… it is easy!! In our Beatrice Ryan Designs 2017 CAL Group… I am seeing so many great week 1 progress photos… Thank you for all showing yours off… If you would like to join the group… Click Here!! For all the CAL Materials and weekly instructions, Click Here!! It’s not to late to join in the fun!! Let’s get started with week 2,,, I can’t wait to see all the pictures!! *Round 20 may seem interesting doing hdc’s then dc’s and back to hdc… this is to square it up. Round 19. Turn work(to wrong side), Join color C in any corner ch 1 sp. Ch 4,(trc,ch1,2 trc) in same sp, trc in the next 5 sts, dc in the next 5 sts, hdc in the next 5 sts, sc in the next 13 sts, hdc in the next 5 sts, dc in the next 5 sts, trc in the next 5 sts, *(2trc,ch1,2trc) in the next ch1 sp, trc in the next 5 sts, dc in the next 5 sts, hdc in the next 5 sts, sc in the next 13 sts, hdc in the next 5 sts, dc in the next 5 sts, trc in the next 5 sts*, repeat *to* 2 more times, join with sl st to top of ch 4. = 188sts. That’s it… Week 2 stitching is complete!! Now… This week only, Block your rectangle.. It may be a little wonky due to going from a circle to a rectangle and if we lightly block it, next week we will have a great rectangle base to continue with!! Congratulations on making it this far on our Crochet with Me!! Winter 2017 CAL!! !